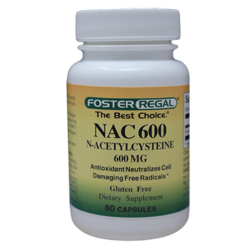 Acetylcysteine is a derivative of cysteine; an acetyl group that is attached to the nitrogen atom. This compound is sold as a dietary supplement commonly claiming antioxidant and liver protecting effects. It is used as a cough medicine because it breaks disulfide bonds in mucus and liquefies it, making it easier to cough up. It is also this action of breaking disulfide bonds that makes it useful in thinning the abnormally thick mucus in cystic and pulmonary fibrosis patients. Other ingredients: K-Gelatin, natural peppermint flavor, vegetable magnesium stearate, vegetable cellulose.